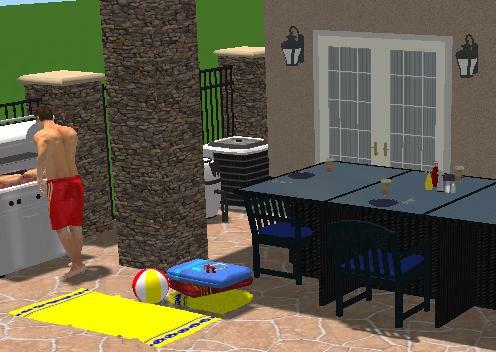 The Yard Accessories Stage of the Landscaping Phase in Pool Studio allows you to place a wide variety of items, equipment, structures, rockwork, lighting, furniture, and more in your design. In this stage you will primarily use the Library to insert items into your design. More than 1000 3D Items for your Project: Pool Studio offers a wide selection of library items for use in your design. Yard Accessories include large structural items such as gazebos, sheds, patio covers, gates, and playsets as well as small accessories such as plates, silverware, wine bottles, and ice buckets. 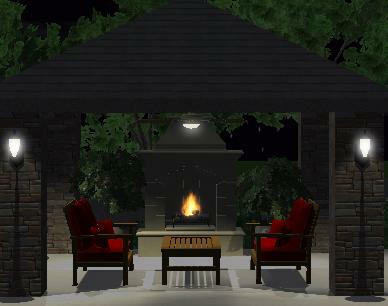 The library has the full range of items to complete your design including equipment, furniture, rockwork, fountains, lighting elements and more. 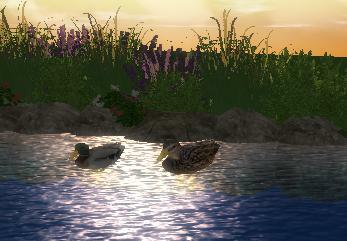 There are even people and animals to position in the design, including animated ducks and fish that swim through the water. There are also items from leading manufacturers and vendors. You can turn off the animation for a selected item by using the Play/Pause button located under Parameters. In the Presentation mode you can stop all animations by pressing the Enter key or by pressing the Play/Pause button in the Presentation menu. You can default item animations on or off for new items you insert with the Default New Item Animations On checkbox located in the library options. Items Tab: All yard accessories are located under the Items Tab in the library. The Items Tab contains a row of Category buttons. Left clicking on a Category button will bring up pictures of the items and templates organized by type. Library items under the Items Tab may be selected by left clicking on the item picture. The item may be inserted by double left clicking on the picture or using the Insert or Insert One buttons below. Items can be edited or deleted by using the Edit and Delete buttons. 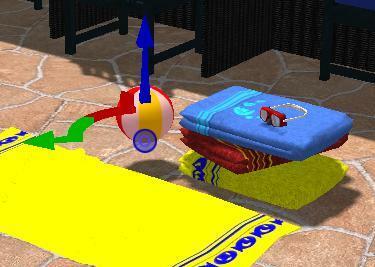 The Items tab contains accessories, equipment, furniture and other items for use during the Yard Accessories Stage. This tab also contains many products from vendors and manufacturers. Replace Selected: This button replaces the item you currently have selected in the design with the item you have selected in the library. This command works well when combined with Select Matching found under Parameters. 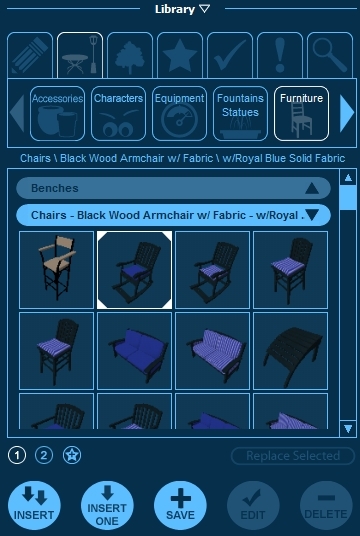 For example, combining both commands allows you to quickly exchange all the tan dark wood chairs in your design with red dark wood chairs. Random Rotate: Select this option when you want to insert multiple items. As you insert the selected item, Pool Studio automatically randomizes the rotation of the next item that you are going to insert. Thus, each time you insert an item, it will have a different rotation than the previously inserted item. Random Scale: Select this option when you want to insert multiple items. As you insert the selected item, Pool Studio will automatically randomize the scale of each item you insert. Thus, each item that you insert will have a different appearance. Show Symbols in Library: Checking this box will set the library items to display as symbols. 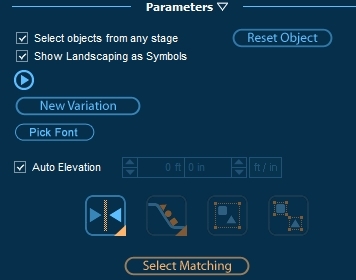 Default New Landscaping to Symbols: Library items may be shown in the 2D viewport either as 2D symbols or as 3D markers. Check this box to have new items insert as 2D symbols or uncheck the box to have new items insert as 3D markers. Items that have already been inserted can be changed under Parameters. Default New Animations On: Checking this box will default item animations on for animated items inserted from the library. This controls the animations for animated items such as animals and ceiling fans located under the Items Tab in the library. If you do not wish animated items you insert from the library to animate, uncheck this box to default animations to off. Animations for items you have already inserted may be turned on/off by using the Play/Pause button located under Parameters. Default New Landscaping Animations On: This option does not have any effect on items. It is used for plants and trees. Search Tab: The Search Tab allows you to search for items in the Library by name. This allows you to find the item you are looking for by searching under its name. 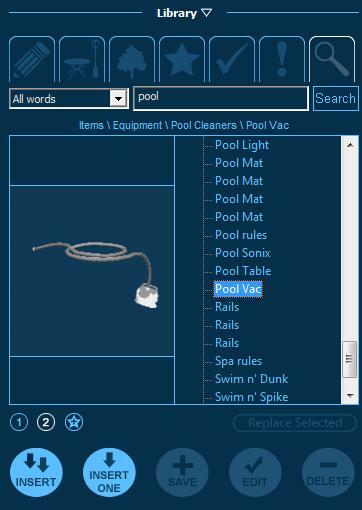 Searching for Yard Accessories: To search for a item, simply type the name of the item into the Search bar and press the Search button. The results of the search will appear below. Single words or groups of words may be entered into the Search bar. You may type in a specific item name such as Gas Meter or type in a category name such as Equipment. The search feature will search item names, categories, types, and subtypes. Search Options: The drop down box to the left of the Search bar allows you to choose from three different search options, All Words, Any Words, and Exact Phrase. All Words will return items that that match all of the words typed into the Search bar. Any Words will return items that match any of the words typed into the Search bar. Exact Phrase will only return items that exactly match the words typed into the search bar. Items Found by the Search: Items found by the search may be selected by left clicking on the picture. The item may be inserted by double left clicking on the picture or using the Insert or Insert One buttons below. Items found by the search are listed alphabetically by name. The location of the item in the Library is displayed underneath the Tab row. The Tab, Category, Type, and Name of the item is listed. Illumination of Lights: Lights will actually create illumination and light up the design. Lights will only turn on when the time of day is set to night. Lights will illuminate the design in the 3D view and in Presentation Mode. Light Settings in Configuration: Lights will only turn on if you have the proper setting tuned on in Configuration. In Configuration go to the Presentation tab and select More 3D Options. Make sure that Artificial Night Lighting is checked. If your computer hardware is unable to display lights this setting will be grayed out. See Configuration for more details. Lights and Computer Performance: Lights may affect your computer performance. Each light increases the demand on your computer hardware. If your computer performance slows down, you may need to reduce the number of lights in your design. 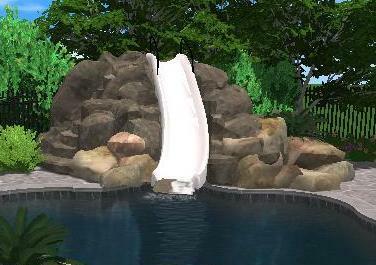 Rock Waterfalls and Slides: Rock waterfalls and slides are used to add rock water features to your design. Some of the slides and waterfalls are premade with animated water flowing over the rocks. Other rock items are designed so that water features may be added from the Visual Features stage. Dynamic Rockwork: Dynamic rockwork uses the same variation system that plants and trees use. When you insert a piece of dynamic rockwork, one of 77,000 different variations of the rock piece will be inserted. This allows the rockwork to appear more natural and realistic. You may change the variation of a piece of dynamic rockwork that has already been inserted by using the new variation button located under Parameters. Animated Items in the Library: Some items in the library are animated. These items are easy to identify because they are be located in animated groups. For example, the animated koi fish are located in the Characters category under the Animated Fish group. Animated items insert exactly the same as regular items. Items that move, such as walking or swimming animals, move in a set pattern starting from the point where they are placed in the design. When placing animated items it is important to understand that animated items will move in their set pattern regardless of other objects in the design. For example, an animated koi fish that swims in a circle will swim in the same size circle regardless of the size of the pond the koi fish is placed in. If the animated koi fish is not placed properly, it will swim through the wall of the pond and into the ground to complete the set circle it swims in. Therefore when using animated items, you must be aware of the pattern of their movement and place them properly within the are you wish them to be animated. Animated Items in 3D: Animated items will animate in the 3D view. You can turn off the animation of a selected item by pressing the Play/Pause button found under parameters. Pause will stop the animations while Play will turn them back on. The Play/Pause button may be used on a selected animated item in both the 2D and 3D views. You can set the default for new animated items you insert with the Default New Item Animations On checkbox located in the library. Items whose animations are turned off here will not be animated in the Presentation Mode. You must turn on the animations for the item here before it will be animated in the Presentation mode. New Variation: This button will change the variation of a selected item. This allows you to change the variation of a item you have already placed in your design. While this button is primarily used for plants and trees, some yard accessories such as Dynamic Rock use it as well. Select Matching: This button will automatically select every item in the design matching the currently selected item. For example, this allows you to select every pine tree inserted in the design.